As mad as it looks? It's time for another Nintendo Download update, and we reckon that no-one should be able to complain of a lack of variety. We have two new 3DS eShop titles, a stone-cold Super NES classic on Wii Virtual Console and a wacky sounding DSiWare title. Check out the details below. Balloon Pop Remix (UFO Interactive, $7.99) — We've previously sampled the delights of popping balloons in the thoroughly decent WiiWare title Balloon Pop Festival, and now the series arrives with a few twists on the eShop. This version involves drawing lines with the stylus to pop balloons and earn combos, with various modes promised including a story mode, over 100 stages in puzzle mode, with endless play and mini-game options thrown into the mix. We'll see whether the it all adds up to good value in our upcoming review. Heyawake by Nikoli (HAMSTER, $7.99) — The Nikoli series of puzzle games is becoming an ever-present on the 3DS eShop, and another new style has been added to the list. The task is to fill in spaces on a board, which is split into "rooms", while adhering to a series of rules that'll make your brain work. There are 50 set stages to clear, as well as a random mode that will auto-generate new levels. We'll wrap our heads around it and bring you a review soon. Crazy Hunter (EnjoyUp Games, $4.99/500 DSi Points) — Crazy Hunter is the latest from EnjoyUp, and your task is to retrieve golden eggs from hens in the clouds. How do you do this? 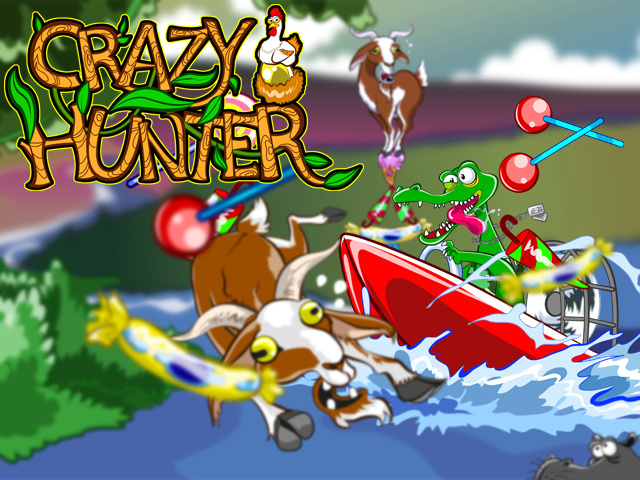 By using a speedboat to knock goats off their candy-made platforms, retrieve them from the water and then use them to build a tower. Crazy is the word, and our review will arrive soon to let you know whether this madness is fun, or too bonkers to play. Prince of Persia (Ubisoft, 800 Wii Points) — This popular Super NES title arrived in Europe back in January, and now it's North America's turn to dive into the adventure. It's an action platformer that will make you jump and manoeuvre your way through some tricky stages while engaging in some swordplay against varied enemies. This version has some content that wasn't on other platforms back in the day, and we gave it a particularly strong recommendation in our Prince of Persia review. The Black Keys "Little Black Submarines" — This week Nintendo Video premieres The Black Keys’ 3D video for their hit song “Little Black Submarines”. Filmed during a secret show in Nashville, the video intimately captures the raw energy this band generates on stage. A bit of a mixture of genres and styles going on this week. Let us know what you're planning to download, if anything, in the comments section and the poll below. C'mon gimme that Adventure of Link already! Stop teasing! Prince of Persia on the SNES is absolutely superb, it's by far my favourite port of the game. when is mario kart arcade part 1 or 2 coming to wii arcade??? @dustin_g A better question is to ask when ANY games are coming to wii arcade. At least America finally got Prince of Persia. Now to move on. Next game Europe has that America has yet to get is Adventure Island II on NES. Came out 11th April 2011. Wow Nintendo, wow. At least there was a VC title that's good. Okay I will buy Prince of Perisa. Again Thank you Ubisoft. If I want to play POP I will just pop in my copy of SANDS OF TIME and play the unlockable version on there. P.S. I'll also take Picross-E. Seriously, Nintendo, I'm a foolish, youthful fountain of cash. Gimme something to spend it on, please. Another week of no 3DS VC, but at least we got a Wii VC game. WOW. Just WOW. Another poor excuse of a week for 3DS VC again like usual. I'll admit, Toki Tori from GAME BOY COLOR last week was a good game to tease the mind. But this week could have kept the momentum going just a bit more next to Prince Of Persia from the SNES. Another thing, where's my Mega Man II on GAME BOY Nintendo?! EU never got Balloon Pop Festival WiiWare did it? Doubt we'll get this. The iOS versions of Balloon Pop seem OK, but not what u'd pay a lot of money for. Prince of Persia, and funk the rest. I was just saying that cause the only game that's Mega Man related form CAPCOM for the 3DS VC is Mega Man: Dr. Wily's Revenge from the GAME BOY. I just wish they would hurry up and release Mega Man II next sometime soon. Just wishful thinking is all. good week last week, bad week this week. I feel so bad for people in America. Why launch a 3DS Virtual Console service if you aren't going to make things available for it? Instead it's all mainly 3rd party shovelware being loaded onto the eShop. NOA needs to get its act in order. @Mr_Trill3506: Probably not for awhile since its coming out as part of the Kirby Anniversary disc on Wii. Rats. I really wanted Picross E.
im sick of buying games twice. the virtual console seemed like a bless at first,then a waste of money. over priced !!!! these games were made years ago, they shouldnt go further than 99cents. some of these titles cost less if you buy them original !!! The Wii's Virtual Console liiiiiiives!! !......Still, I wanted Picross E soooooo badly. Maybe Crazy Hunter if the review is good. But I want more Virtual Console games for the 3DS, and bring back the weekend sales! Another week of mediocrity. Im sure glad I bought into the Wii and 3ds so that I could be frustrated with lackluster gaming titles and no Robust online multiplayer network to really speak of. I've been gaming since 1978 (yep im old) I have never been more frustrated in gaming than I am now. You really get this feeling Nintendo is either holding back on some imports (like monster hunter) or they are having a hard time with 3rd party developement. My guess is a little bit of both. I bought a 3ds with the intentions of it being my last gaming console. Since day one it has been a lackluster gaming lineup. I have given it plenty of time and if things dont get better soon like they did with the DS Im going to jump ship and move on. If I wanted to sift through an online shop of crappy games I would use my android phone or Ipad for gaming. As for Wii-U all my trust in nintendo is gone. I will wait quite a while and see what happens to it. There are some good games for both systems however this 70% to 80% of bad titles model is inexcusable. Does anyone notice how the ratings in the Eshop for every single game are good? I can kinda see Crazy Hunter being a $5 game b/c it looks like they put some effort and originality into it, but how on earth are a puzzle game and a balloon popping game $8 each? I'm not stupid enough to try and compare an iOS or Android game to a full blown Mario or Zelda or Metroid game, and I understand the whole "buttons and sticks are better than touchscreen" argument, but those eShop games need to be $2 or $3 MAX. You can play similar games FOR FREE if you have a Google Chrome web browser. @Jese_1: Sniff... That means a lot. Sincerely, it really does. I'm actually willing to buy the games, since I didn't have them as a youngin'. Thanks for the sympathy. @Tasuki I say it will because both Japan and Europe have it on the 3DS VC and all regions are getting the Kirby's Dream Land Collection on Wii only. Ah!! Finally, you've got the SNES version of Prince of Persia on Wii's Virtual Console dear Americans!!! One more thing before I go today is Theatrythm. I downloaded the demo and a really good game. However 40.00 dollars for the game cart then .99 cents per addon content. OMG! I think the demo was pretty cool and game is cool. but I think 19.99 for the game cart and then .99 for addon content is more in order. How long are we going to continue to be gouged? Bought another E-Shop card this weekend hoping for a decent week this week. Oh well, time to download a few games off my wishlist. Yay, Prince of Persia! I thought we would never get it. @Windy Theatrhythm is worth way more than $20. A discounted DLC bundle would be a better idea. The only "Hunter" I want to see in the future is Rhythm Hunter. And why are there so many Nikoli games? I remember when Best Buy sold the Wii version of Prince of Persia brand new for $4.99 which came with the SNES game. According to the excellent SNES Prince of Persia review on this site, the SNES version is NOT the one playable in the wii version. Sorely tempted by Prince of Persia. I wanted to get it many moons ago, but never did. Wasn't it released by Konami back in the day, and Ubi got the rights? Wasn't there suppose to be sonic games coming out during that 8-bit summer promotion? why nikoli's games become more expensive??? Still waiting for Wario Land 2, Kirby's Dream Land 2 and Picross E, all of which have already made it to Europe. Come on NoA!!! I'm personally not interested in any of the games on offer, but at least we're still getting at least 2 3DS games (not counting DSiWare), instead of the one. As long as they release at least 2 3DS games a week (2 3DS Downloads, 2 3DS VC, or one of each), I'll be content. According to Wikipedia this was the 400th wii virtual console game, so I was hoping a first party big name like Yoshi's Island, Mario Picross or SNES Star Fox, but PoP is ok.
NoA needs to get a LOT of things in order. There are so many things that are so wrong with Wii and 3DS right now...and sadly, as awesome as Wii U can be, I can very easily see some problems with the Wii U already. For example, that account system. From what I know so far, it seems the "account system" is more like just separate profiles that are TIED TO THE WII U. Basically like having multiple 3DS or Wii profiles on the system. So far, it doesn't seem to be linked to a real online account. If Nintendo can prove me wrong next week by announcing that accounts will actually be Nintendo Network accounts in the vein as every other online service available nowadays instead of being merely separate on-system profiles, AND have them connected to Club Nintendo, then I'll start doubting Nintendo's methods a tiny bit less. They've always done so well before online got so important to modern gaming...now that they're going into online more it seems like Nintendo is in disarray on what they should be doing...at least mostly in America. Japan seems to be doing much better than America. They need to bring back the sales. $8 for a download I will play 5 hours max is just too much for me. I need to stop looking forward to Thursdays. Nothing big this week. Im sure the best stuff will arrive around the holiday season! For anyone wondering about Prince Of Persia, the version included as an unlockable bonus with Forgotten Sands on Wii is NOT the SNES version, despite what it says on the packaging...it's just the bare bones original game. I played through Wii Forgotten Sands and unlocked it earlier this year. The SNES version is actually an enhanced port of the original game with additional levels and much better graphics/music/sound FX and controls. The only way to play SNES PoP (which is probably the best version of PoP, by the way ) is to buy an original SNES cart or download it off the Wii Virtual Console. $8 for a download I will play 5 hours max is just too much for me. I'm waiting for Picross e. Please come to America soon! not again for eshop... craaaaaaap!!!!! There sure wasn't much fanfare, then. In the past, Nintendo has publicized the milestone and released something major! I'm wondering if that 400 total is including games that have been removed from the Wii Shop due to licensing issues (I think there were some Irem games, TMNT, etc.). If that's the case, we'd still be a few short, and a mega release could still be forthcoming! After last week's good selection, why are we back to bad again? Still no gamegear sonics or any GB games, and bad 3DSware again (Balloon pop seems decent though.) Where the heck are those sonic games we were promised 2 months ago? Looks like NOA reached into my turd infested toilet yet again and put this garbage on the eshop. Meh. Balloon Pop Remix looks nice ( but it's coming from UFO, not getting my hopes up. UFO is making another Game & Watch style game on DSiWare game called Retro Pocket ( UFO, don't reuse ideas from games that are already bad). @TNLGUY I stopped a long time ago. huzzah nikoli brought one of my favorite of their puzzles to the eshop! @Bass_X0 Because we were expecting the sonix games for the longest time. Come on, you know you want the Sword of Hajya to come out sometime! Blaaaahhhh... 8 dollars for a balloon popping game (from UFO!?) You've got to be kidding me.. There are free ones on the App Store for my iPad that are way cooler too. I'll wait for the review on Crazy Hunter; that's the only one that has my attention this week. @grumblegrumble I have yet to own any Android or Apple devices, so I am a bit naive on the subject. Are the free versions shareware, or full releases? If it is the latter, what is the business model that they are using? Is it just someone releasing something for free out of "the goodness of their heart"? Please enlighten me. deleted nintendo video A LONG TIME AGO. im suprised no one else other then @TheDreamingHawk has done this. Thank you so much. I hadn't considered the ad supported route. That is not my style at all (DVR everything I watch on TV for this very reason), but makes perfect sense. As a programmer by profession I know that the truly great games/programs that really stand the test of time show an acute attention to detail, and have coat after coat after COAT of polish. That is what I have always treasured about console gaming: The great games are really something special. I feel saddened by current trends. I get a nasty feeling in my stomach that we are all heading for another crash. It just feels to me to be a race to the bottom. Plenty of cheap and 'good enough' titles, but far from enough polish or attention to detail. Regarding the Nintendo Video topic: Dinosaur Office and Son of a Pitch are two series that have struck a chord with me. Also, I have always dug the quirky artsy things that come along every two months or so. The music videos are OK. I find myself watching them once, and then soon forget about them. For me, the title is perfect for those times in life where I find myself waiting for a brief, yet indefinite period of time. The quasi-five minute wait for my girlfriend to leave work and get to the car, or that uncertain window of time while waiting at the doctor's office to be called. @dustin_g There's a part 2? Am I the only one getting sick of these stupid puzzle games on the 3DS? The DS suffered from the same thing and it's just annoying, give me some fun games not some brain busters? I go to school for that. Anywho, nintendo of america needs to step their game up, like sure you had a goodish week last week but make it consistent? One good week then 10 bad ones is pretty dumb, spam us with awesome games, it's not like the VC is hard to do? Port NES and SNES and even some GBA games and the eshop will be flooded with money. I've been tempted to give Prince of Persia a try ever since I saw Arino try to beat it on Game Center CX. Maybe I'll make it my next download, once I have time for it. Hey c'mon guys, at least we know Fluidity Spin Cycle is coming, eventually! (finds out that it's cancelled) okay, we're in for a crash. ...and just to clarify, Fluidity is not cancelled, that was a joke. Although I wouldn't be too surprised if it did end up cancelled, the way things are going so far!! @TheDreamingHawk: We were never promised anything. When will we stop getting all this crap on the eShop and start getting weekly discounts again. Also I am still waiting for those 2 Sonic games that should have come out during the 8 Bit Summer campaign! No one should be able to complain? Oh I beg to differ. Sooo... Nintendo releases a bunch of VC games on 3DS for a month, then totally ignores the VC section for a whole month? That's a bunch of crap. Give us Kirby's Dream Land 2. I already have the other games on the 25th Anniversary Collection on my Wii and 3DS, I just need one more! I was wondering that same exact thing about today's week & lame VC update! Prince of Persia would have counted as the #400 game... but if you look down the list of NA VC games on Wikipedia; I actually counted 10 that were marked through as being removed from the Wii Shop due to liscening issues! So if my math adds up; there are actually #390 games! I think if NOA continued with the Wii Shop during the first months of the Wii U & into 2013... we'd still have a ways to go to get to #400 again! I stopped giving a crap about the eShop when I realized my local store still stocks a ton of old DS titles. Playing through MechAssault: Phantom War, Radiant Historia (FANTASTIC game, that), and SMT: Devil Survivor. I also want Oracle of Ages/Seasons. It is a new month and the announced GameGear games never arrived!! Nada for me. Waiting on my next Gamefly game, Nostalgia or Radiant Historia. @Tasuki Uh, yeah. Watch the 8-bit summer trailer and see when those games were slated to come out. July. That never came. I kinda understood a slight delay at first maybe due to an over of VC, but 2 months is ridiculous. I'm not the only one unhappy about the lack of those two games either.